This entry was posted on November 11, 2012 at 12:06 am and is filed under Parenting. You can follow any responses to this entry through the RSS 2.0 feed. You can leave a response, or trackback from your own site. It is a shame to see hidden agendas played out in the education of young children. Time enough for that when they get older. I agree with the child’s father. I remember a new principal (female) taking over a school where I worked. Oh, I have no objection to female principals. It’s the principles that concern me. This lady systematically went through all the school readers and destroyed any that depicted what, when I was growing up, a normal family, where mother worked in the home and father went to work, boys played with cricket bats and girls with dolls. Take this kind of action together with the feminisation of the teaching service and you would be excused for coming to conclusions about why boys are confused, without clear role models, and are consistently falling behind girls in education. Speaking as both a parent and teacher (3rd grade for many years), my issue with this worksheet is it’s clear that this girl has never been taught handwriting properly. I wouldn’t accept this handwriting at all (of course I would HELP the child improve the handwriting, step-by-step, with positive feedback, not just tell them “improve your handwriting). The only way I could read “Arts and Crafts” that the girl wrote in the third column was to look through the list above to find a category that started with “a!” Then I was able to figure out what she wrote there…. That is so funny! I too couldn’t get past the sloppy handwriting. In fact, it bothered me more than the worksheet itself! Glad to see it bothers others, as well. I have had an almost lifelong aversion to writing. I put this down to having had to rewrite ad nauseum pages of school exercise books because of my poor handwriting. It was as if an expensive gift was ignored for the appearance of the box. Consequently my aversion to writing anything down has taken on pathological proportions which has had a negative impact on my career as a teacher. This was only relieved in recent years with the advent of computers but the fear of adverse judgment of anything I write has remained, palpably, in the background. As a teacher I teach handwriting, but by golly I accept anything a child writes for me and don’t take issue with the handwriting because I know there is a difference between carelessness and lack of fine motor development. With a class of intellectually impaired (not my term) children I used to have them read anything they wrote to me. I would then type their writing on a sheet with a space for their illustration. I would scan the illustration with the typed writing, which would then become a page of an illustrated book written by the child. These became class readers and the children loved to read each others’ stories. John, that’s crazy what your principal did! Those old readers were actually FAR superior to teaching reading skills in an organized fashion than today’s readers are (speaking as a reading specialist, parent, and teacher). Lynne, she wasn’t my principal. I decided to take a year off and do a course at university. As concerns the child’s handwriting, one would hope that it is the best she could do. I teach handwriting. I expect children to write legibly and give them practice and instruction in doing so. 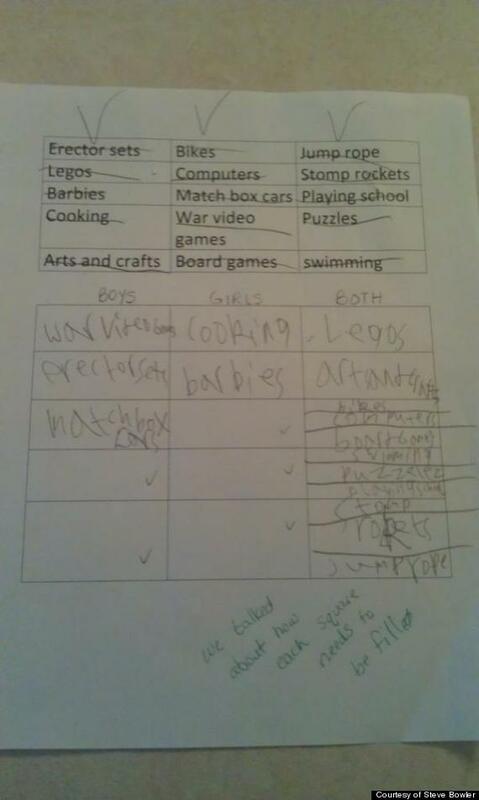 However, young children’s handwriting is a work on progress. How old is the child in question? I would guess about 8. The issue over the handwriting is a non sequitur. The handwriting does improve as children develop fine motor control. To take issue with the handwriting is like a teacher I once had taking another child in the class to task because of her broad Yorkshire accent, completely ignoring the child’s spoken response. I do, however, take issue with the actual assignment, which I think the young girl did quite well. The issue I take is with the political nature of the exercise. It would be like marking a child wrong for expressing support for Romney, rather than Obama, or vice-versa.